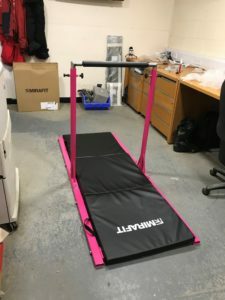 A member of the Red Box team decided to surprise his little girl with a unique and bespoke gift for Christmas, so the Red Box Engineering team had the pleasure of making a personalised gymnastics bar last year. Christmas is already the best time of year for a child, so having a personalised gift made it even more exciting. The process for making this gift was something of a routine practice for the guys at Red Box. They started by measuring and cutting up all the materials needed and followed up by using the water jet to cut out all 6mm plates. Next they cut all the tubes to size using their chop saw and drilled the uprights using the Haas CNC milling machine to allow the height of the bar to be adjusted. After being drilled, the legs and braces were then to be welded. Following the completion of the frame itself, the whole structure was sent off to be powder coated in a particularly vibrant magenta. The finished product looked perfect and delivered in time to be wrapped for Christmas.